Kevin is blinded by a spitting viper in the Valley of Death. The title of this episode is based on the motto "In God We Trust" which was added to U.S. coinage in 1864 during the Civil War and which became the official U.S. motto, despite some protests, in 1956. Like a typical teenage boy, Kevin's idea of bird watching is using his binoculars to spy on girls! In this case, Christa while she goes for a swim in the pond, since she is the only human female around (besides his sister). While doing his "bird-watching" Kevin is interrupted by a Triceratops who is not Princess, as evidenced by it having two complete horns on its head. Christa refers to the binoculars as "far-eyes". As seen throughout the series, Stink often mimics the words and phrases spoken by the Porters after they say them. Here, he mimics Annie's tone of voice as she calls for Tasha. Listen: Tasha! As Tom explains to Stink that they are going to build a raft out of logs and vines, the Paku suddenly produces an animal jawbone with serrated teeth, proclaiming "Stink cut vines!" Since Stink does not wear clothes and is not carrying a pouch, where did the jawbone suddenly come from? He was not holding it a few seconds earlier! And he did not pick it up from the Porters' things because they do not recognize it. It's like he's Bugs Bunny or something! When Tom asks Kevin if he's coming along with the rest of them to build the raft, his son replies, "No, Pasadena, Dad, I'll take a raincheck." Pasadena is a city in southern California. Here, Kevin appears to be using the city's name as a slang term for "I'll pass." Kevin finds the skull of a saber-tooth tiger in the Valley of Death. Are there still living ones in the Land? 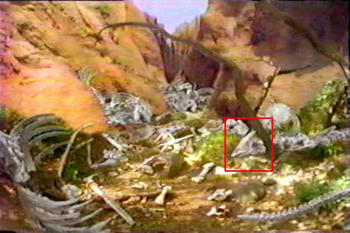 At 9:12 in the episode as Kevin walks through the Valley of Death, we see the skeletons of many creatures. To the right is a large, crested skull that may be of a Parasaurolophus or Pterodactyl. But it appears to be attached to the long neck of a sauropod dinosaur! Possibly, it is simply the juxtaposition of the skull and another, unrelated, skeleton or that it is a sauropod skull and skeleton with another bone or rock behind it creating the illusion of a crest. At 9:42 in the episode, Kevin discovers what appears to be a very large, pre-carved stone spearhead. What is it doing in the Valley of Death? Who carved it? As Kevin approaches a large skull, Tasha starts making even more noise than usual and shaking her head. Did she smell the viper that was coiled within? 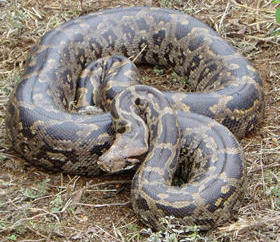 The "viper" (Christa calls it a shika) that crawls out of the skull actually looks more like a python. LOTL spitting viper Indian rock python (from the Friends of Snakes Club). 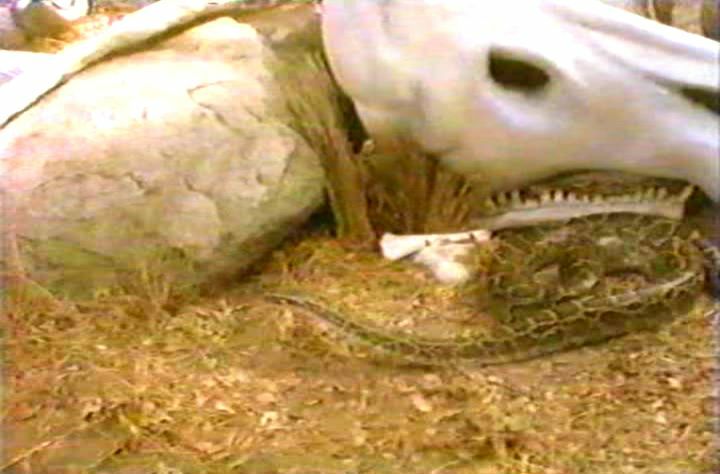 As the snake is seen slithering away at 10:52 in the episode, it looks more like it is being pulled along by its handler, obscured by a conveniently placed tree. Ironically, Kevin is blinded by the venom of the spitting viper after he had just been caught spying on Christa while she swam. At 16:37 in the episode, we find that Tasha has got herself caught in a net trap, hanging from a tree. Although it is never mentioned, presumably this is a trap set by the Sleestak (as seen in the first season episode "Wild Thing"). At 18:47 in the episode, we see, once again, Scarface "pulling a Grumpy"...he stands there looking and roaring at Kevin and Tasha when he should be chowing down on them! And then he gives up rather easily after Tom throws a makeshift spear into his neck. A T. rex should be able to take more abuse than that when fighting for a meal. Unless we missed the inclusion of some ingredients, Christa's medicine to cure Kevin's blindness is concocted of some type of mashed berries mixed with water. She then soaks a handkerchief in the mixture and applies it to Kevin's eyes. 15:00 Christa says, "Acuba ne, Porters, Stink." "Greetings, Porters, Stink." 15:03 Stink says, "Acuba ne." "Greetings." 18:38 Stink says, "Anu, Annie, anu!" "No, Annie, no!" 19:38 Stink says, "Shika! Malu! Malu!" "Shika! Bad! Bad!" 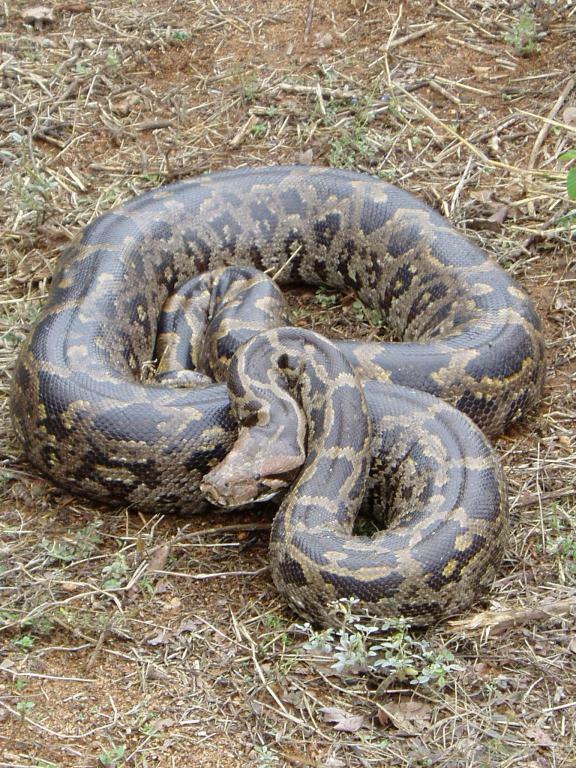 Shika is the Pakuni name for the type of viper that has spit its venom at Kevin.